Like me, many fellow Brits are familiar with the hysteria surrounding the Warped Tour. The iconic Pop-Punk juggernaught is often hailed as an event at the pinnacle of the 'Punk' music scene, often copied, yet never fully imitated. Perhaps the nearest replication this side of the pond, is the hugely generic Give It A Name festival - this however is disregarding Warped's ill fated stint at the Reading/Leeds weekend. This travelling Punk circus to the previously uninitiated like myself seems something of a novelty. Helped in part by the music of Blink 182 (Rock Show anyone? 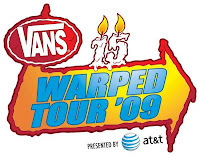 ), music, summer, and pop-punk are all synonymous to the iconography of the Warped Tour. Reality and ideals though are separate beasts. It must be noted though, that hosting a show the size and scale of the Warped Tour in the UK is not only implausible, but virtually impossible. Owing dependently on the vastness of the American landscape, the United Kingdom cannot compete, and various genre specific shows instead rely on patchwork collections of overseas tours bungled into a cross weekend bill, as opposed to a cross continental slog. The Tour's concluding stop is LA's Home Depot Centre, a city with a facade not dissimilar from that of the tour, steeped in myths, and mistruths. With the sun beating down on the dusty parking lot, settings seek to only fuel the exhaustion facing many of the bands appearing. Despite being held in high regard to many musicians, this is not a tour for the weak, and behind the veneer and exterior aesthetics, the hard work of many of the acts, and others involved must be commended. Opening Hurley stage act The Maine, epitomise everything about the current tour. A thoroughly contemporary act, well, a carbon copy of various other pop acts to be precise, deliver an astute, upbeat performance in the Californian sun. In stark contrast, Saosin are the worst act of the day, actually, the year. Maybe victim of the aforementioned exhaustion, Cove Reber is easily the worst live vocalist to grace the stage today. As he wails 'We speak in different voices', those in attendance can rest assured that we sing in them too, thankfully. On the Main Stage, Less Than Jake deliver a light-hearted, horn infused set reminiscent of late 90's 'third wave ska, which was once popular'. Their words, not mine. Jokes aside, LTJ are easily one of the best bands of the day, and future attendees should be glad to know that this won't be the last time they appear on a Warped Main Stage. Playing classics such as 'All My Best Friends Are Metalheads' ensures that whatever the band do, they will always be fan favourites, and when accompanied with on stage banter, they provide the perfect respite to other acts, whose tone is not so informal such as the pristine and pretentious Chiodos. In contrast, as frontman Craig Owens shouts something to the effect of: 'I want to see you all punch someone,' I can only imagine the humour of the previous act appears to have been somewhat lost on the Michigan boys. On the smaller stages, Valencia are very, very good as they deliver an honest performance, and when taking the bands documented personal matters into account, is even more impressive, as the lyrics take on a deeper more profound level than probably any other act on show. Back on the Hurley stage, to a massive crowd, A Day To Remember chug through an all too familiar set of shouts breakdowns, and chorus'. The band have hype, and a following, the only problem they now face is establishing longevity, a hurdle which could prove difficult, even for a band on such a current high. As the sun begins to set over Los Angeles it becomes increasingly apparent that, despite the large bill, the Warped Tour is not about diversity. Despite several stand out acts, the day could largely have been spent watching the same act, as hundreds of identikit bands are swamped by thousands of identikit fans. This is not to call the Warped Tour a failure, as it is far from it. The hoards of people, combined with the image of the tour, speaks volumes for the successes it's had over the years. Many bands would give various body parts for a place on the whole tour. Here perchance, is where we find the problem with Warped. The status now associated with Warped is that it can make or break bands. In essence, the tour symbolises everything flawed with the American Dream, and transcribes it into music form.